Hi everyone! Yay! The Snowflake Sparkle September card kit will be available NOW in the MFT boutique. White on kraft paper is so wonderful! This works perfectly with these amazing snowflakes. I heat embossed them with white embossing powder on kraft panels that I cut out with the Stitched Mini Scallop Square STAX dies. I added a touch of red with the tiny hearts. You can create easy holiday and Christmas card series and mass production with this fabulous set! White on Kraft...Swoon! Your snowflakes are so pretty, and I love how you added the hearts! Really sweet card trio, Francine! Love the snowflakes on kraft! Great CAS cards, love kraft card stock!!!! I also love white on Kraft! These are just the cutest little cards. The tiny heart in the middle makes it so sweet! These are so sweet. Love the simplicity and the Kraft. Loving these ideas. Love the kraft cardstock and the heart in the center! This is a beautiful card, very simple yet elegant. 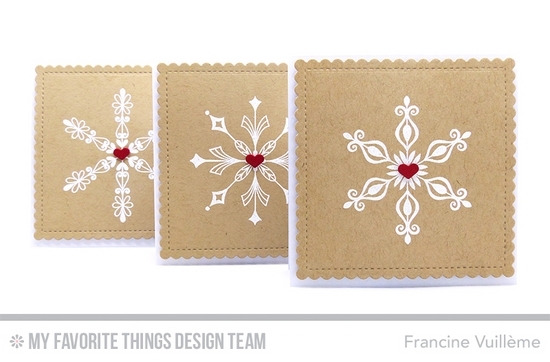 The white snowflake stands out on the kraft paper and the red heart takes it one step beyond. Perfect! Thanks for sharing. The white on Kraft is so awesome!!! I love all your cards for this kit!!! I love the sweet simplicity of these cards. Well done. OH, I love this!! Your cards really show off the gorgeousness of these snowflakes!! The clean and simple style is so perfect!! OMG these are so striking. I just love them. Gorgeous card trio! Love the crisp white on kraft! Very simple looking card but very eye catching! This is a different take on making a card and I love it. Great Job! Very cute with the white on kraft and the addition of the red heart. Very pretty! Love white on Kraft! I love these! So simple, yet stunning! Love the white snow flakes on Kraft. The added heart is special. Very simple, crisp and clean, love it! Beautiful. 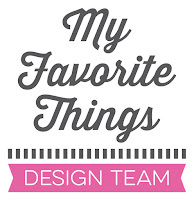 Love your design and I really love the use of the Kraft cardstock. These cards are so lovely! Wonderful for making a whole bunch!! Love them! Thanks for sharing. Love your simple and classy design. Oh wow! I’m in love!!! This kit is wonderful and your cards stunning!!! sigh... your cards are stunning!! love white on kraft! These are so elegant! I love the red heart in the middle of the snowflakes. Simply stunning (and so easy to mass produce)! These snowflakes are so pretty on the kraft paper! Such pretty designs on the scalloped kraft!